You’d be surprised how often customers ask us: do you guys carry women’s boots? Of course we do! Red Wing Richmond carries a variety of boots for women and can special order anything you can’t find in the store! Our women’s boots specifically tailor to the form, structure, and unique needs of a woman’s feet. These aren’t just resoled men’s boots: these are purpose built, just for women. 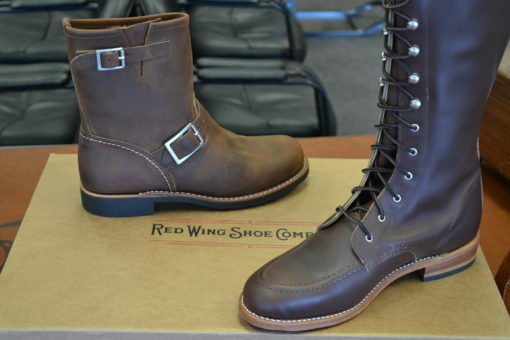 At Red Wing Shoes, our master craftsmen and women create only the best quality boots, for both men and women! Our women’s boots are built to the same exacting standards as the men’s boots, and have earned the same reputation. You can rest assured that any pair of women’s boots you buy from Red Wing are the result of our artisan cobbler’s designs and are battle tested for hundreds of thousands of hours by women just like you before we bring them to retail. If you are looking for a specific type of women’s boots, look no further. We carry women’s hiking boots, dress boots, leather work boots, hunting boots, and more. Red Wing believes that every person should have a pair of boots that are built specifically for the task at hand, as well as the person performing that task, and women are no different. We are confident that you will agree with the reputation we’ve earned for quality once you’ve seen and worn a pair of Red Wing women’s boots. See below for some of the selection you can find at our stores! Contact Red Wing Richmond Today! Ladies: get started with a new pair of Red Wing boots today and reap the benefits for years to come! We recommend you stop by one of our three Richmond area Red Wing Shoe stores to get custom fitted and ask any specific questions. You can also leave us a message on Facebook, contact Red Wing Richmond online, or call us!